Different Sections like "General Statistics", "E-commerce" and "Conversions"
I released this dashboard primarily as an example for students enrolled in the UBC Award of Achievement program I’m tutoring as well as the Laval University course I’m teaching. I also use it as a demo in the Roadmap to Online Analytics Success workshops. Based on the numerous feedbacks I got since its release, I realized lots of analysts and agencies are using it as a starting point. 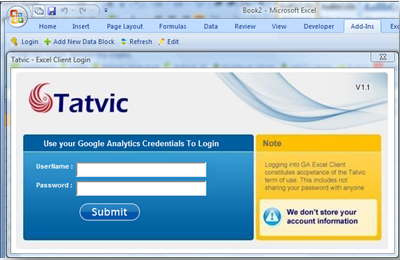 Some of them had asked for Google Analytics automation and I referred them to Tatvic GA Excel plug-in. With this enhanced version, Tatvic actually just made this job very easy! 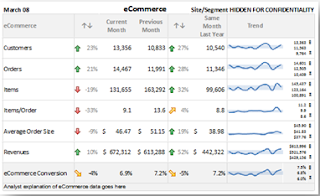 Trends and % change indicators: the up/down red/yellow indicators are based on 5% variations of month-to-month or year-to-year values. Those should be updated to your own threshold sensibility and set to their according positive/negative significance. For example, increase in visits is usually a positive thing (green/up) but increase in bounce rate is typically a negative thing (red/up). Segmentation, Automation & Customization: once you understand how to add any metric to your dashbord it becomes very easy to tailor this sample dashboard to your own needs. Adding a new segment is more complex but can be done if you look how they are configured in the spreadhseet. Control limits and Significance: Based on any given metric, the spreadsheet will automatically calculate upper/lower control limits and show them beside the sparkline. Furthermore, the sparkline itself use +/- 1.5 Standard Deviation – a statistically valid way to define the control limits range – and make it easier to spot outliers. Extracting the data from Google Analytics interface and putting in the back end of template was a tedious and time consuming process. Also copying and pasting data in exact cells was prone to human errors. But one of the most important features which need a special mention is the "Refresh" functionality. With a single click all your dashboard data gets updated much quickly and without much hassle! Go to "Background sheet" and replace the profile name from Tatvic.com to desired one. Follow the same method for start and/or End date and/or advance segment. Click Refresh and see your dashboard getting update within few seconds! Your dashboard is ready, you can update it on monthly basis or any intervals required. All you have to do is follow the method described above and the data gets updated quickly. Moreover you can customize it with your own KPIs. Please share comments / feedback / critique / about it. Do you have any dashboard tricks to share? How do you think this sample dashboard could be improved?